Before I begin I will preface this article with the statement: All mass murders take place in GUN FREE ZONE’s! If you love your kids…Buy a gun and ‘Home School Them’. Don’t be ignorant my friend, your kids will pay the price. Fabian Gov. Jerry Brown signs more gun control bills leading to the incremental agenda of complete disarmament for the totalitarian State of California. California Dictator. Jerry Brown signed measures to end the last narrow allowances in the state for campus carry, open carry of any kind and making it illegal for a gun to be on any school campus, paving the way for another Sandy Hook massacre, this time in any school in the state. Brown, a far left wing extremist hate America Communist, signed AB 7, AB 424 and AB 1525 while rejecting SB 464, aimed at ramping up security measures at gun shops across the state, as an overreach. What a twisted Commie mind he has. He not only doesn’t want to protect your kids at school, he doesn’t want those who provide protection to have any security either. Assembly Bill 424, sponsored by Assembly member Kevin McCarty, D-Sacramento, with the support of the California Federation of Teachers, state PTA, and the National Association of Social Workers as well as a host of anti-Constitutional gun control advocates, ended the ability for a school district superintendent to give permission to someone to have a firearm on campus to protect your kids. We should attribute the next mass shooting in a GUN FREE ZONE in California to Comrade-Dictator Jerry Moon Beam Brown my friend. The move was a follow-up to a general ban on campus carry passed by lawmakers in 2015 in the wake of news that at least four school districts in the state were granting limited exemptions. McCarty said Brown’s signature affirmed California’s commitment to GUN FREE schools while thanking Moms Demand Action for their “leadership” on the issue. But gun rights advocates said Brown’s signing of AB 424 will not only not improve public safety, but what it will do is guarantee another school massacre. “The Legislature and Governor Brown have made sure that no good people with guns will be close enough to stop an evil or insane person in the event of a serious attack,” said Brandon Combs, president of the Firearms Policy Coalition, in a statement. Assembly member Mike Gipson, D-Carson, backed AB 7 to expand the state’s open carry prohibition to cover shotguns and rifles carried in unincorporated areas in other words all guns. The law will make it is a misdemeanor to openly carry a long gun in a public place where the discharge of a firearm is prohibited in an unincorporated area of a county. Public lands open for hunting and target shooting are still not affected, in the incremental total ban on guns I can only guarantee it is on the slate for next time. “In effect, this bill closes a narrow loophole in California’s existing open carry prohibitions,” Brown said in his signing message. The move caps a half-century of incremental regulation on the open carry of loaded firearms in the state that began with the Mulford Act following armed meetings of the Black Panther Party in the 1960s, and in recent years restricted the carry of handguns in general and long arms in incorporated areas. Brown approved restrictions on the open carry of unloaded handguns in 2011. The third measure signed by the governor, AB 1525, authorizes new warning labels printed to direct those buying a gun to the website of the California Attorney General for information on complying with state firearms laws. Backed by the hate America group Brady Bunch Campaign, the move is the latest installment of the state’s mandatory gun warning labels which have been standard since 1993. Jerry Moon Beam Brown has signed a bill banning concealed weapons from California schools and universities, a measure that drew renewed attention after a recent massacre at a GUN FREE ZONE in an Oregon community college. SB707 by Democratic Sen. Lois Wolk of Davis will prohibit people with concealed weapons permits from carrying firearms on school and college campuses. People who have concealed carry permits would be, because of a law suit, allowed to carry firearms within 1,000 feet of a public or private K-12 school, but not on the grounds. If the man wasn’t already 77 years old I’d think he was running for President. So in the wake of yet another GUN FREE ZONE being shot to pieces a bit up the coast from his state, Brown has decided to respond by ensuring that every school in the state maintains its GUN FREE ZONE status. That’s just brilliant, isn’t it? He wants to make sure there is another Sandy Hook massacre, but this time in California. Brown is reacting in a typical, Fabian progressive fashion to the last school shootings and just trying to make it look like he’s doing something – anything – rather than being carried along on the tides of history. Unfortunately the message he’s sending is that potential shooters should keep their Google Maps app up on their phones and find all the local K-12 classes. It’s open season in California schools. Contrast this to Texas, where opponents are struggling to figure out how to implement the Campus Carry law which goes into effect next year. (CNN) The bill many know as the “campus carry” law is scheduled to go into effect August 1, the 50-year anniversary of the University of Texas Tower sniper shooting, one of the first mass murders on a college campus in America. THE BOTTOM LINE: We should revisit this in about five years and see how many school shootings take place in protected Texas schools vs California’s unprotected GUN FREE ZONES. No matter which way it breaks, the results ‘should’ prove instructive, but they won’t. 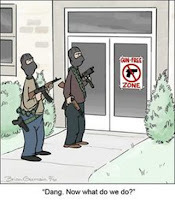 On A personal note: If I had my way anyone involved in the GUN FREE ZONE laws that lead to the next mass shooting, should be brought up on charges of coo conspiracy to commit mass murder and put in front of a firing squad. In addition, parents should demand security in the schools or pull their kids out.